Today Microsoft announced they are renaming their mobile device cloud service Windows Intune to Microsoft Intune. Reason in mine opinion Microsoft is sorting to great new features and capabilities like enterprise bulk enrollement, conditional access and extended data leak protection (DLP) which will be expected later this year (Q4). This change reflects Microsoft’s ongoing strategy for Intune as a cloud-based mobile device management (MDM) and mobile application management (MAM) solution. 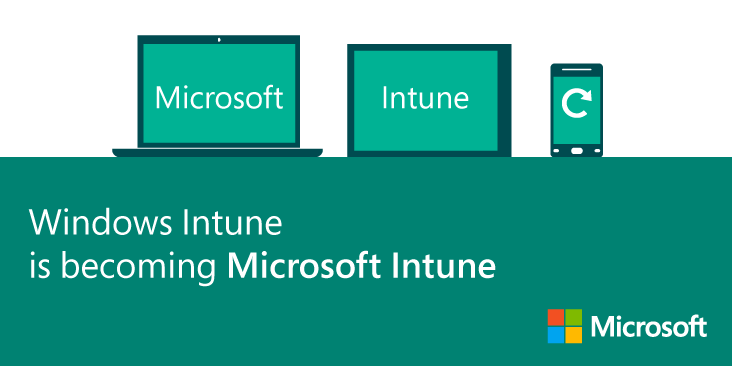 The “Microsoft Intune” name more accurately represents Intune’s capabilities, supporting both iOS and Android platforms, in addition to Windows. It is also in alignment with our commitment to embrace the new dynamics of the workplace, and increase employee productivity by enabling them to work wherever and whenever they want on any device, while helping IT keep corporate information secure. Intune is included in the Enterprise Mobility Suite (EMS) which is Microsoft’s comprehensive and cost-effective solution for addressing consumerization of IT, BYOD, and SaaS challenges. The suite also includes Azure Active Directory Premium and Azure Rights Management (RMS). Read the the full story here. July 11th Microsoft announced the beta of the next there next release of Windows Intune. Simplify the task of distributing software and updates – In addition to Microsoft patches and updates, you can now use Windows Intune to deploy third-party applications and updates to your managed PCs. Manage all your software licenses. If you need a better way to manage all your software licenses, look no further. Now you can upload and track Microsoft Retail and OEM licenses and third-party license agreements in addition to Microsoft Volume License agreements. Get better hardware reporting. We’ve made it simple for you to view or create reports on hardware data—including manufacturer, chassis type, available disk space, installed memory, and CPU speed. Last week I was at Microsoft site following a technical workshop of Windows Intune. Windows Intune is a cloud based services which provides client management solution for managing and securing PC’s for small and midsize companies in any location throughout the internet. Today companies are facing challenges in managing PC’s. Think about multiple configurations, different versions and licenses. Lack of insight and reactive response instead of pro-active to support issues are topics on top of mind of administrators. Windows Intune provides online PC management from anywhere over the internet. The management console is browser-based (Silverlight is required), so administrators can be anywhere. Windows Intune requires no server infrastructure, offers per-seat licensing and it is easy to deploy, use and maintain.